3D printing is typically a realm for plastics. But what happens when a pair of inventors wants to use metal? It becomes molten, a unique process not yet seen in metal manipulation. 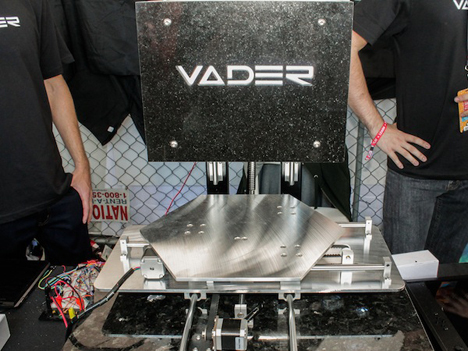 When the jump is made from plastic to metal, the name Vader is smirkingly ironic. Father and son team Scott and Zachary have created the Vader Printer. Using molten aluminum, it maneuvers around processes that use lasers or anodizing while still creating complicated shapes. After the aluminum goes through a thermal chamber, it becomes magnetized in order to be extracted onto the printer bed. 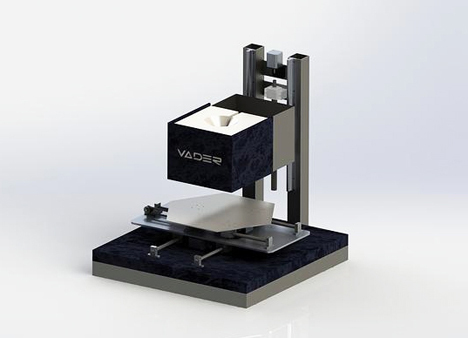 The Vader has a huge granite base that’s necessary to absorb the molten metal’s heat. The only previous method to print metallic, known as laser sintering, composed fine metal powder into solid objects. The current Vader system has been in development for seven months and is predicted to carry a $10,000 price tag when it’s released sometime in 2014. See more in Industrial Design or under Technology. November, 2013.